The Green Arrow that I first got to know was the Denny O'Neil/Neal Adams version from the 1970s. When he teamed up with Green Lantern, and they tackled those heavy social justice issues. I was young enough at the time that I think a lot of it went over my head initially, and I didn't pick up on the commentary until I re-read them years later, but I do think I like the idea of a superhero that tackled problems that seemed a little more mundane and got pissed off when Green Lantern tried sloughing off the regular people. My dad picked up the Mike Grell stories later when I was a teenager; I remember reading many of those, but I don't think probably all of them. I eventually picked up the 2001 series launched with Kevin Smith, but not until it had been running for a couple years. 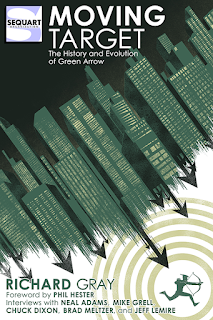 So Green Arrow hasn't been a constant presence in my comics world, even taking into account the periodic absences of his own title, but -- thanks largely to those early O'Neil/Adams stories -- I always kind of dug the character. So I was happy to get a chance to read Richard Gray's Moving Target, published earlier this summer by Sequart. I've got several of the Sequart books and documentaries, and they'd all been pretty solid. I expected and got no less from Gray's book. The first challenge in writing a history of Green Arrow is that the character has really been all over the place creatively. What Gray does is obvious enough -- tackling the character's trajectory in a fairly chronological fashion. This is made easier somewhat by not having several books about him being published simultaneously. And with some noticeable gaps in the character's publication history, it becomes fairly straight-forward to break the history down into chapters covering pretty distinct periods. Gray takes advantage of many of the creators who remain alive to discuss with them in a fair amount of detail how they worked on the character. This not only informs the book's premise, but by including the full interviews, it helps to round out the perspective as one that's larger than Gray himself. I found the portions of the book covering periods when I wasn't reading about the character very insightful. I was certainly aware, for example, of his creation by Mort Weisinger and George Papp, but I'd read few of those stories, and knew little about the character before Jack Kirby took him over in 1958. But more significantly, Gray's book also provided me broader character insights from the periods that I had read. His analysis of Grell's run was especially educational for me, and provided for a fascinating look at a character I had mostly assumed was still the O'Neil/Adams one I had read years earlier. Further, Gray is able to develop a connecting thread throughout all the iterations of the character, including the multiple TV versions that have shown up over the past decade or so. Given the changes the character has undergone, I have to say this really impressed me that he was still able to find a common thread. The writing is solid and, like I said, provides a lot of insights about the character. If you're familiar with any of the Sequart books, Moving Target falls very much in line with their general style and direction, which is, to my mind, a very positive thing. I really like the editorial direction of Sequart overall, and just really wish there had been an outlet like theirs twenty years ago. Chalk another success up for them!